These bars start out with a crispy and buttery shortbread base which is topped with a creamy cheesecake, tart granny smith and a rolled oat crumble before being finished off with a drizzle of salted caramel sauce! 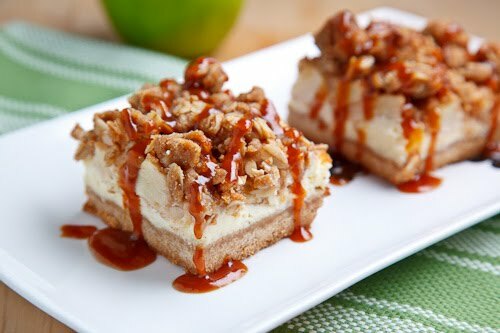 These caramel apple cheesecake bars made their way around the food blogging sphere not to long ago and they certainly caught my attention! Even just by reading the title, they sound amazing but that is just the start! If you dig a little deeper you will see that they start with a base of butter shortbread which is topped with the cheesecake followed by the apples and then a layer of rolled oat crumbs only finally be topped with the caramel sauce. These bars are like combining shortbread , cheesecake , apple crisp and caramel sauce all into one truly spectacular treat! Given all of the components, these bars require a bit of effort to make but overall everything is pretty straight forward and it so worth it! You do have to pull the cream cheese and butter out of the fridge ahead of time to come to room temperature so keep that in mind when making these bars. This recipe calls for lining the baking dish with aluminum foil which I had never done before and it turned out great! After chilling the bars in the fridge over night I gently pulled on each end of the aluminum foil and the whole sheet of came right up and out, nice and cleanly! No more destroying half of the bars trying to dig them out of the pan! I will definitely have to remember this trick! When I got up this morning my patience had run its course and I could not resist pulling the caramel apple cheesecake bars out after a night of chilling. (I hope it’s not wrong to have cheesecake bars for breakfast!) My expectations for these bars were certainly high and they exceeded them beyond my wildest dreams! This is just one of those things where the combination is far superior to the sum of the parts! All of the flavours and textures work so well together with the tart apples balancing out the sweetness of the other components. The crispy short bread crust contrasted the soft cheesecake and tender apples and the crumb topping added another dimension of texture. The caramel sauce was of course the star of the show and the coarse sea salt in it was particularly nice. These are going to disappear quickly! Cut the butter into the flour, sugar, salt and cinnamon until combined and crumbly. Press the mixture into the bottom of an 8×8 inch baking dish lined with foil. Bake in a preheated 350F/180C oven until lightly golden brown, about 8-12 minutes, set aside and let cool. Beat the sugar into the cream cheese until smooth. Beat in the egg followed by the vanilla extract. Mix the apples, cinnamon, sugar and nutmeg. Sprinkle the apples on top of the cream cheese layer. Cut the butter into the flour, sugar, cinnamon and rolled oats until combined and crumbly. Sprinkle the crumbs on top of the apples. Bake in a preheated 350F/180C oven until the cheesecake has set, about 25-35 minutes, and let cool. Heat the sugar and water in a sauce pan over medium heat and simmer it until it turns a medium amber colour. Remove from heat and carefully pour in the heavy cream. Return to heat and cook until smooth, stirring with a wooden spoon. Allow the sauce to cool for a few minutes and stir in the vanilla extract and salt. Let cool and serve over the apple cheesecake bars. You certainly were right to have these for breakfast, they have all the ingredients for a good breakfast: oatmeal, apples, cheese, eggs! Weren't they awesome! mmmm I've been craving cheesecake bars for a while. Wow, these look so yummy! These look amazing! I'd try them for breakfast too, and I know they won't last long at my house. Oh boy, should not have read this post or looked at the photo! Those must be heavenly! Apple and cream cheese desserts are divine. Wow,that looks so good!I'm going to try a gluten-free version with goat chevre sometime. You definitely had me at the title alone, Kevin! These are a marvel, both to look at and to taste! Love that you made these. Definitely one of my favorite desserts this year. I love anything apple caramel and think these make a totally acceptable breakfast (you know, the apples). Great touch with the sea salt, too!!! These sounds a great combo of all things scrumptious! yummy. Thanks. They are so pretty and just the perfect autumn dessert. Made these for a holiday party last night. They were heavenly. A couple of thoughts, though: 1.) Spray the aluminum foil; my crust stuck to it; 2.) I used Smucker's caramel sauce to cut down on the amount of work involved. Still very tasty, though I'm sure making it from scratch would have been ethereal! I made these to bring to work and they turned out very well. I used a 9×9, because i didn't have an 8×8. The caramel sauce didn't work out at all, but the bars tasted great even without it. bidins711: Glad you liked them! Caramel sauce can be a little tricky and it took me a few tries to get it right at fist but once you get the hang of it it is actually pretty easy. These were great! They were a lot easier than they appeared to make. I didn't even attempt the caramel sauce, I baught a jar of caramel topping instead. I also baked them for 40 minutes, then bumped up the heat to get them a bit more crispy! I made these last night, not making any tweaks for changes to the recipe. Insanely good! Please give tricks on how to make the caramel sauce. It’s a pain. The trick to caramel sauce is patience! It will take a while to cook and I am sometimes tempted to either leave the stove to do something else while I wait or to turn up the temperature but I need to stick with it and watch it. Once it starts to turn colour you need to act. An easier caramel sauce would be to take 8 ounces of the caramel chewying candies and to melt them in a sauce pan with 1/4 cup of heavy/whipping cream!